Brahiner is a friendly and sweet teen who lives with the challenges of cerebral palsy. He is unable to walk but has some use of his hands. Until recently Brahiner had a power chair. Unfortunately it was damaged in a vehicle accident robbing Brahiner of his independence. He is unable to propel a manual chair on his own and is currently using a borrowed manual chair. Brahiner is a social guy! He loves talking to people and is a great conversationalist. He is bilingual and can speak Spanish and English. Brahiner enjoys music too. He unites with millions of teenagers who pump up the volume listening to Selina Gomez or Justin Bieber. You can add the healing power of laughter to his list of favorite things; Brahiner gets a dose of laughs while watching his program of choice, The Ellen Show, starring actress and comedian Ellen Degeneres. He thinks she is hysterical! Like most teenage boys, Brahiner loves food and his idea of a perfect meal is a trip to the local Chinese buffet. His hobby is painting which allows him to expresses passion and emotion. 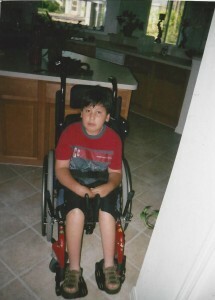 Brahiner desperately needs a new wheelchair so that he can get back out there and meet more people! Please help us give Brahiner back his independence!